Group Mobile, a rapidly expanding premiere provider of innovative, full service mobile technology solutions has expanded its product line to include the new Getac A140 fully rugged tablet. The Getac A140 is a purpose-built, fully rugged tablet for public safety, automotive, field service and military personnel. The Getac A140 was designed in fusion with a leading automotive manufacturer, the highly configurable A140 offers the largest screen real estate in Getac’s lineup to date. 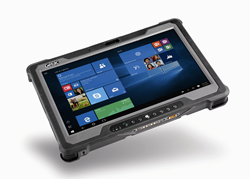 This A140 rugged tablet operates the Windows 10 operating system and is powered by an Intel Core i5 processor. It can be optionally configured with the Intel Core i7, i5 vPro, or i7 vPro processors. The Getac A140 tablet comes standard with 4GB of memory (expandable to 32GB) and an Opal 2.0 128GB solid state drive, with upgrades to 256GB or 512GB solid state drives. The Getac A140 tablet features various touch modes, allowing for operation in the rain, with gloves on, and utilizing a hard-tip stylus. Three USB ports, dual RJ45 LAN jacks, HDMI and an optional serial or VGA give the Getac A140 a rich choice of I/O ports. The Getac A140 has built-in WiFi and Bluetooth, and optional dedicated GPS and 4G LTE multi-carrier mobile broadband to keep users connected. Workers can use the optional slim-profile vehicle dock to avoid crowding cab space in your vehicle with tri-pass through ports for connection to high-gain GPS, WWAN and WLAN roof mounted antennas. Additionally, the Getac A140 can be configured to include an RFID reader, a 1D/2D imager barcode reader, and a fingerprint scanner. Dirt, dust, water, vibration and extreme temperatures are known to be hazardous and detrimental to consumer-grade tablets, when using the Getac A140 workers can be secure knowing the tablet meets MIL-STD-810G and IP65 standards for durability and extreme protection. To learn more and order the Getac A140 fully rugged tablet visit: https://groupmobile.com/getac-a140.html. Group Mobile, a wholly owned subsidiary of Form Holdings, headquartered in Phoenix, AZ, serves customers world-wide. Group Mobile is a rapidly expanding and growing and innovative full end-to-end solution provider of rugged mobile hardware, lifecycle services, system integration, hardware service support, pre-and post-deployment, break-fix, warranty repair, customer support helpdesk and more — all constructed to solve pressing problems and ensure our customers are receiving exceptional value, return on investment and a trusted long-lasting partnership. Group Mobile has mastered the true challenges of mobility through understanding the key elements required for a successful mobile deployment — hardware, connectivity, data and customer back-end network infrastructures. Visit http://www.groupmobile.com for more information.